Tax time is just around the corner, and it is fitting that we review the mortgage interest deduction and the implications of a divorce or separation agreement that requires one party to pay home mortgage interest on a home owned by both parties. The payment of interest may be alimony rather than mortgage interest. Generally, home mortgage interest is any interest you pay on a loan secured by your home (main home or a second home). The loan may be a mortgage used to purchase the home, a line of credit, or a home equity loan. You can deduct home mortgage interest if all of the following conditions are met. You file Form 1040 and itemize deductions on Schedule A. The mortgage is a secured debt on a qualified home in which you have an ownership interest. Both the owner and the lender intend that the loan be repaid. In most cases, you can deduct all of your home mortgage interest, however, there are limitations on the mortgage interest deduction in general as well as limitations in a divorce or separation agreement which requires one party to pay the home mortgage interest on a qualifying home that is still owned by both parties. The limitations are discussed below. In most cases, you can deduct all of your home mortgage interest. How much you can deduct depends on the date of the mortgage, the amount of the mortgage, and how you use the mortgage proceeds. If all of your mortgages fit into one or more of the following three categories at all times during the year, you can deduct all of the interest on those mortgages. Mortgages you took out on or before October 13, 1987 are called grandfathered debt. Acquisition Debt: Mortgages you took out after October 13, 1987, to buy, build, or improve your home (called home acquisition debt), but only if throughout 2013 these mortgages plus any grandfathered debt totaled $1 million or less ($500,000 or less if married filing separately). Home Equity Debt: Mortgages you took out after October 13, 1987, other than to buy, build, or improve your home (called home equity debt), but only if throughout 2013 these mortgages totaled $100,000 or less ($50,000 or less if married filing separately) and totaled no more than the fair market value of your home reduced by (1) and (2). If a divorce or separation agreement specifies that one party pay home mortgage interest on a home owned by both individuals, the payment of mortgage interest may need to be considered alimony paid rather than as a deduction or mortgage interest. 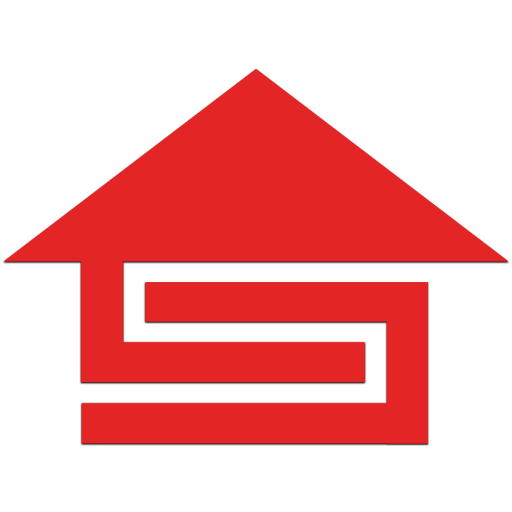 Simply having a marital settlement agreement that states one party shall have the right to deduct the payment of mortgage interest may not stand up to the general rules of the I.R.S. regardless of when the divorce or separation instrument was executed. Not all payments under a divorce or separation agreement are considered alimony either. Use of the payer’s property. Is It Mortgage Interest or Is It Alimony? Example 1: Ownership of the property is transferred to wife. Under the separation agreement, husband must pay the real estate taxes, mortgage payments, and insurance premiums on a home owned by the wife. If payments otherwise qualify, husband can deduct the payments as alimony on his return, and the wife must report them as alimony received. If itemizing deductions, wife can deduct the real estate taxes and, if the home is a qualified home, also include the interest on the mortgage in figuring deductible interest. Example 2: Expenses paid on a Jointly-Owned Home. If the divorce or separation agreement states that one spouse must pay expenses for a home that remains jointly owned by both parties, some of those payments may need to be classified as alimony paid and alimony received. Many times in a divorce separation both spouses will remain on title of the home until a future date or event. There may be tax implications on how the mortgage interest deduction is classified regardless of how it is addressed within the divorce or separation agreement. 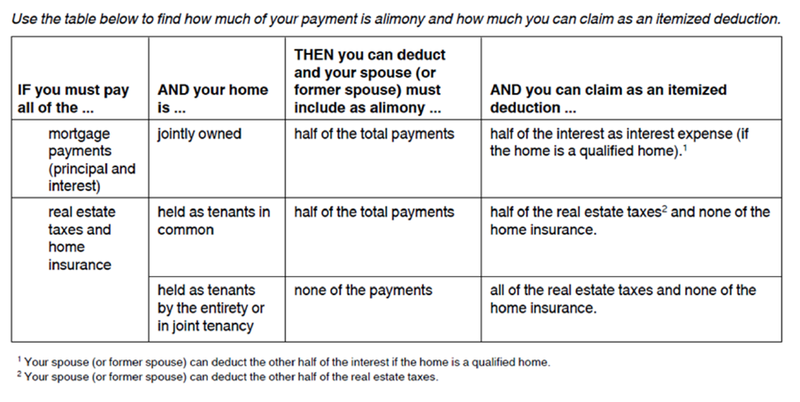 Below is a great chart that outlines how much of the mortgage payment, including interest, taxes and insurance, should be classified for tax reporting purposes. You can see that it is all important to identify exactly how ownership is vested (jointly owned, tenancy in common, or tenancy by the entirety.) If I can be of assistance to you in obtaining the information as to how your clients currently hold title on the property in question, please don’t hesitate to reach out to me. Contact me through email or give me a call at 469.917.5335 for any questions or advice!